Not only do these tender triangular treats, with colorful, jewel-like fillings, taste as good as they look, they’re surprisingly easy to make and are sure to impress. 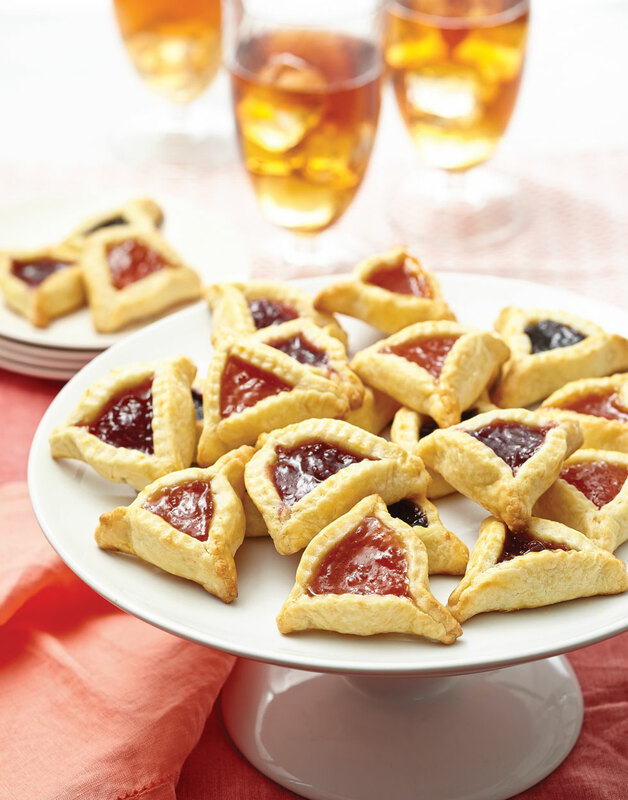 More pastry than cookie, hamantaschen are the quintessential dessert for the spring holiday, Purim. Dubbed the Jewish Mardi Gras, it’s synonymous with drinking, dancing, and gifting food to family and friends, most notably, hamantaschen. And while simple to make and easy to form, this is very tender dough because it’s made with cream cheese, which gives it more flavor, but means it’s prone to lose its shape in baking. To lessen the chance of that occurring, use a fruit butter or thick preserve for filling, and be sure to freeze the cookies after forming them. A Hungarian specialty, lekvar is a thick jam or fruit butter found throughout Central and Eastern Europe. The ripe fruits are seeded or cored but cooked in water with their skins (which are later strained out) for flavor and color. Find lekvar at grocery or specialty stores with other jams or in the kosher section. Or choose your favorite fruit butter or preserves as a filling, or for variety, use several different fruit fillings. For the dough, beat butter, cream cheese, sugar, and zest with a mixer on medium speed until smooth. Add flour and salt to the butter mixture and beat just until incorporated. Divide dough in half and shape halves into disks; wrap each in plastic wrap and chill 8–24 hours. Roll one dough disk on a lightly floured surface to 1/8-inch thick. Cut dough into rounds with a 3-inch cutter. Transfer rounds to prepared baking sheets. Repeat rolling, cutting, and transferring of remaining dough disk; reroll scraps once and repeat method. For the filling, spoon 1 tsp. fruit butter in the center of each dough round; brush egg around edges. Form triangle shape by folding in edges, pinching into corners, and leaving an opening at the center of the filling. Brush exposed dough with egg. Repeat filling, brushing, folding, pinching, and brushing with all remaining dough rounds and fruit butter. Freeze cookies 2 hours. Roll one dough disk at a time to 1/8-inch thick. Cut rolled out dough into rounds with a 3-inch cutter. Spoon 1 tsp. filling in the center of each dough round, then brush edges with beaten egg. Form triangle shapes by folding in edges, pinching corners, and leaving an opening at the center of the filling.